Baseball vs Climate Change: The Dodgers play the Senators today in D.C. for the right to destroy the Cubs’ hopes and dreams in the NLCS. The Division Series is played in a 2-2-1 format, meaning two games in Washington, two games in Los Angeles and then a deciding fifth game back in Washington. The idea is to give the Senators the home field advantage because they are the higher seed. That’s a lot of jetting back and forth and spewing a lot of unnecessary greenhouse gases right into the atmosphere. HWR suggests: going back to the 2-3 format used prior to 1985 and show some respect for Mama Earth. BTW, home field advantage in the baseball playoffs has been found to be no advantage at all. The Washington Metro’s Navy Yard Station that serves the Senators’ ballpark. Photo: Wikipedia. 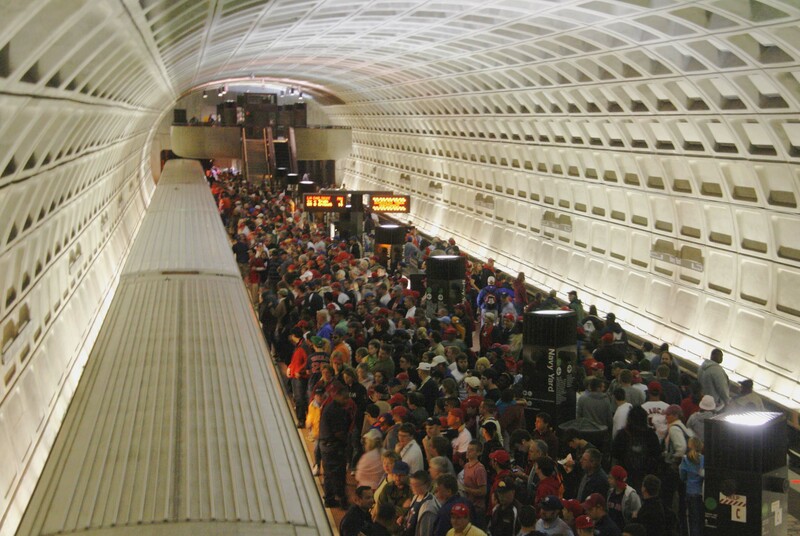 Baseball vs the Washington Metro: The last subway train that allows fans to connect to other trains leaves the ballpark at 11:39 p.m. The games have been almost four hours long (which is crazy). So if tonight’s Division Series Decider runs long because the Dodgers are running up the score (jinx!) and you see a lot of empty seats, you’ll know why. Read the entire article from Sports Illustrated. Systems testing: As you hear on the station announcements, we’re doing some systems testing on the Blue and Expo Lines today, thus the extra trains you’ll be seeing out there between the peak hours. Whaaaaat? : Did I just hear on KCRW that Paul McCartney is playing Pappy & Harriet’s tonight? It’s going to be a great night for some lucky desert souls. I’ve never seen a dude dressed up as a cheese coney before. Our Ohio readers will appreciate. As part of its first draft of a proposal for Measure M in March, Metro said that the amount of delay experienced by drivers stuck in traffic will be reduced by 15 percent by 2057 while the percentage of people taking transit will increase. “When certain projects are completed, some people will notice improvement right away and some not so much,” said Pauletta Tonilas, chief communications officer for Metro. Anyone who’s lived in L.A. for the last decade has personally experienced traffic getting worse. If you do a lot of screaming and pounding on the steering wheel now, just wait. Congestion is expected to double over the next 20 years as population here grows. And Metro’s projections for traffic relief will mostly be felt by those driving in the areas where Measure M projects will be built — once they’re built. Over the span of 40 years. Susan goes on to write that she’s finding that she can get where she needs to go via transit, but it usually takes much longer to get there. She also says that people are driving less (that’s a debatable fact), but wonders if enough people will stop/reduce driving to make a difference traffic-wise in the future. Attentive Source readers know that we’ve been talking about the transit vs traffic issue for many a year now. Perhaps another way to look at that issue: transit can provide a good alternative to traffic. The Measure M ballot measure would raise the countywide sales tax by a half cent and continue the Measure R half-cent sales tax beyond its mid-2039 expiration date to fund a number of transit, highway, walking and biking projects. To learn more about the ballot measure, click here. I also recommend taking a look at the timeline of projects and programs funded by the ballot measure — click here and scroll down. A man with two knives who charged two Los Angeles Sheriff’s Deputies at the Downtown Santa Monica Station was charged with attempted murder of peace officers. The suspect was shot and wounded by deputies, closing the station for many hours. About 55,400 rides were taken on Metro’s Bike Share program in DTLA from its opening in June through the end of September. That’s not as much as other large cities, although there are some caveats — other programs opened on a more extensive basis and in cities with more bike infrastructure. All in all, Metro officials said they were pleased with the numbers. Interestingly, there were more trips per bike in DTLA than in Santa Monica during that time frame, which I found surprising considering how bike-friendly SaMo is. In terms of trips-per-bike, Gotham has a huge lead over other cities. I’m guessing the fact that Gotham has eight million inhabitants doesn’t hurt. 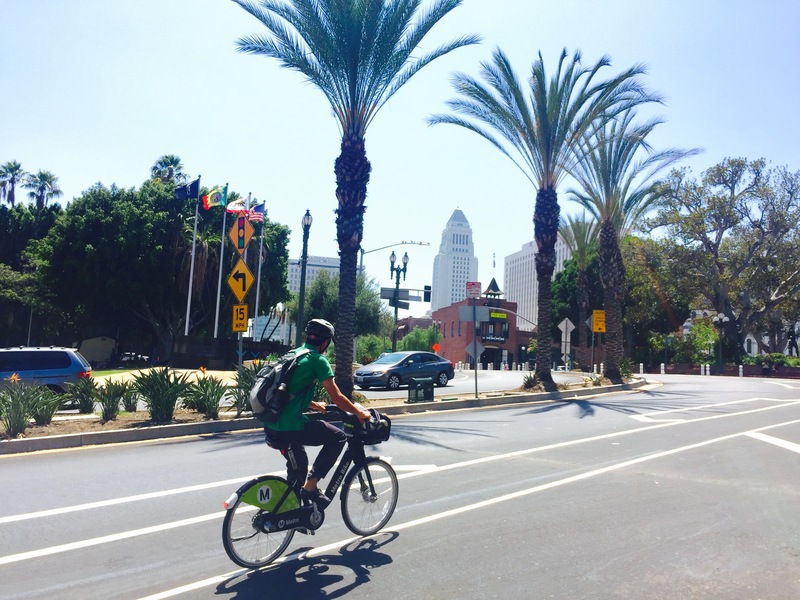 The Metro Board will soon consider expanding the bike share program to Pasadena. 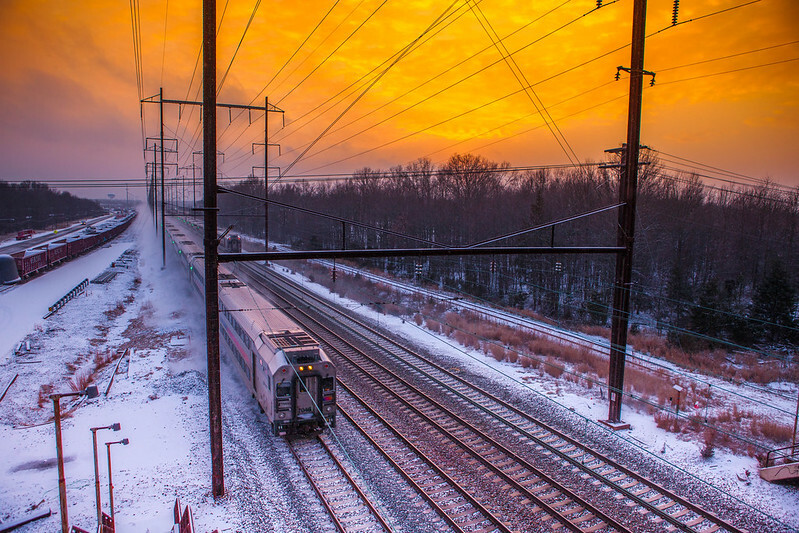 Transportation experts argue that New Jersey Transit needs dedicated sources of revenue similar to those that New York’s Metropolitan Transportation Authority has, instead of relying on a tumultuous state budget process. New York collects a fee on taxi rides, a payroll tax and other taxes for its transit system. Many delays are a product of aging infrastructure that includes not just the Hudson River tunnel but also the Portal Bridge, a century-old swing bridge over the Hackensack River. It is difficult to imagine better service without a massive overhaul of the entire corridor leading to New York City — a project that Amtrak, which controls the corridor, says could cost more than $20 billion. C’mon, New Jersey! Get it together! Take care of your own! From the Dump that Jumped…. How We Roll, Oct. 12: Bring on the Cubs! Is this related to 6-minute headways? Or maybe even signal preemption?? Great questions! I’m guessing the answers are “yes” to 6-minute testing and “no to signal pre-emption. I don’t think Metro has ever operated 6-minute headways on both the Blue and Expo Lines at the same time. During normal commute hours they operate 6-minute on Blue and 12-minute on Expo. During major events (e.g. football games at the Coliseum) they operate 12-minute on Blue and 6-minute on Expo. They could be testing to see how well they can accommodate a train turning around every 3 minutes at 7th/Metro, and also testing the operations at signals along Flower. You fail to mention the light rail construction mess that has been going on in Hawaii. A light rail system has been under construction for many years yet no service has started even along it’s furthest segment. It’s completely elevated for some reason unknown to me and stations have not even started to be built. The big question now with billions in excess of the projected budget is where it will terminate or should it be completely abandoned as the majority of voters have expressed in polls. It is quite impressive seeing miles of concrete stretching across open fields in search of a suburb to terminate. Why the constant calling the Washington NATIONAL League team the Senators? Calling them the Expos I could see, especially given how they were removed from Montreal, a city that built the only new Metro in North America in the 1960s, and it’s the current name of a Metro Los Angeles Line, so somewhat Trolley-doddering related. Because I’m old school and am currently refusing to acknowledge the 1969 MLB expansion!